Sept. 2, 2006 -- Representatives of Arkansas State University and the Arkansas Army National Guard signed an agreement Saturday that provides scholarship support for National Guard soldiers who attend any school in the ASU system. Dr. Les Wyatt, president of ASU, and Maj. Gen. Ronald Chastain, adjutant general of the State of Arkansas, signed a memorandum of understanding (MOU) during events associated with the Reserve Officers’ Training Corps (ROTC) 70th anniversary reunion at ASU. The agreement has special significance for ASU, as well as the Guard. "This is the first MOU that we have signed on behalf of the ASU system," Dr. Wyatt said. "This agreement with the National Guard addresses all ASU campuses. This is the first system-wide agreement, but it won’t be the last. This scholarship program gives us the opportunity to demonstrate the advantage of a system of campuses." A student who receives a National Guard scholarship while at one campus will be able to carry the scholarship when transferring among all of the ASU campuses. "Once a student is a student at one of our campuses, he or she is a student at all of our campuses," he added. The scholarship, valued up to $4,500 per year, is available until the student graduates. It provides the cost of tuition, which is based on course load, up to $4,500 per year. Members of the National Guard who are currently enrolled are eligible this semester. Close to 100 students are eligible immediately at Jonesboro, and close to two dozen more at the two-year ASU campuses. This is an especially good opportunity for the National Guard because the number of Guardsmen is particularly large in this region of the state. While the program was initiated at ASU’s two-year campuses last year, it becomes more valuable this year because the agreement provides for the student to move freely between the campuses. 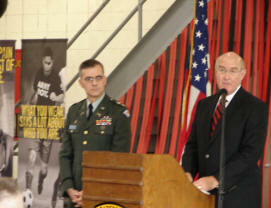 "This program has several advantages not only to ASU but also to the Army," Dr. Wyatt added. "Assistance with the cost of education helps with recruitment. Also, today’s Army is a very technical Army, and they need very educated people."